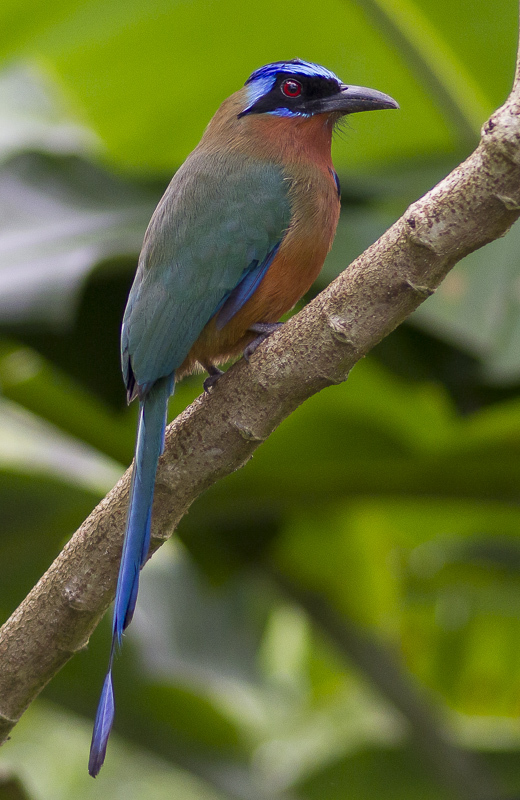 Excellent photo of this Blue-crowned Motmot, momotus momota. Great sharpness, details, beautiful natural colours and a nice pose with eye contact in a pleasing composition. you have positioned the Motmot perfectly in a well composed shot with the branch nicely across the vertical corners. Super sharp details and very pleasing colours. What a gorgeous bird you have photographed, your image shows it off nicely in exceptional detail and beautiful natural colors. I love their unique looking features such as their long tail and black mask. I was fortunate to photograph one this past year while in Nicaragua, and must admit it was truly a thrilling sight to view in the wild. Well captured my friend, nice and fine colours. neat presentation. Beautiful bird species and image..well done. tfs. Needless to say its a beautiful picture.Colour and pose is really eye-catching.I like its pose.Nice use of light with good sharpness.Like BG too. An excellent capture,remarkable details of plumage and lovely colours,very well exposed and well balanced composition.TFS. amazing colors with excellent detail and focus.